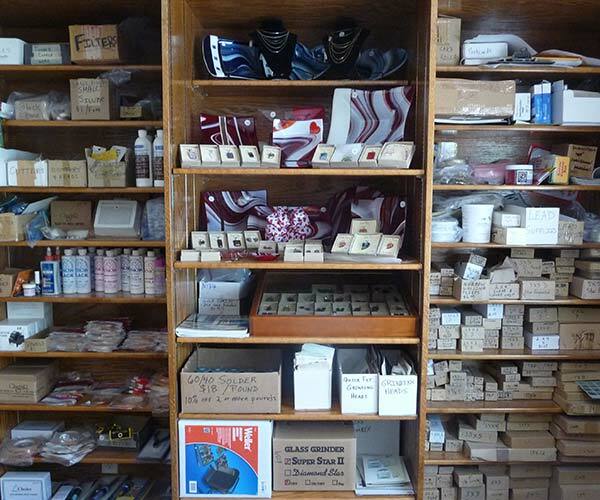 All supplies, tools, books, and glass are available for purchase by students and retail customers. Discounts available for wholesale customers and teachers. can be rented for in class use at $20/class session (4 weeks). can be rented for in class use at $2/hour. can be rented for in class use at $4/hour. 1st Day of Class: No tools required. You will get to try GGG tools. You will pick out a pattern to work on. 2nd Day of Class: You will need to purchase or rent tools 1-5. 4th Day of Class: You will need to purchase or rent tools 6-8. Jigs for your pattern are loaned to you by GGG and should be returned when your project is completed. If you are not a current student, jigs cost $5.00-8.00 to put together plus materials. 16G Black Jack Chain $1.00/Ft. 16G Copper Jack Chain $2.00/Ft. 16G Nickel Jack Chain $1.00/Ft. 18G Nickel Jack Chain $1.10/Ft. System 96 Shoebox Size Scraps $2.00/lb. 14, 16, 18, & 20 Gauge $8.25/4 oz. Jewelry Findings & Chain: Nickle, sterling, sterling plated, and gold plated pendant bails, earring bails/wires/posts. Barrette clips, ties clips, sterling silver chain 16-24" long, key chains, and wine stoppers. Fusing Supplies: System 96 and 90 glass, frit, stringers, noodles, decals, pebbles, precuts, confetti, dichroic glass (scraps, squares, spirals, dragonflies, firesticks), molds, shelf paper & primer, Kaiser-Lee Board, copper tooling, lava cloth, paints, and wash-away.